On June 10, ISS crew spotted a micrometeoroid impact on Cupola Window 2. The window was immediately shuttered and damage appears to be minor. The Cupola is a popular hang out for ISS crew, who enjoy taking photographs of Earth and space from its windows in their down time. Cupola is also used for enhanced visibility of visiting spacecraft and utilization of the robotic arm. The Cupola has seven windows – one on top and six in a hexagon around the circumference. Each one has a shutter that is closed when the window is not in use to add an additional layer of protection from the space environment. Typical MMOD shielding structures (ISS Interactive Reference Guide). Micrometeroid and orbital debris (MMOD) impacts are part of life in low Earth orbit. Throughout the station, different shielding elements are applied to handle the inevitable impact from small orbital particles – too small to track and avoid. 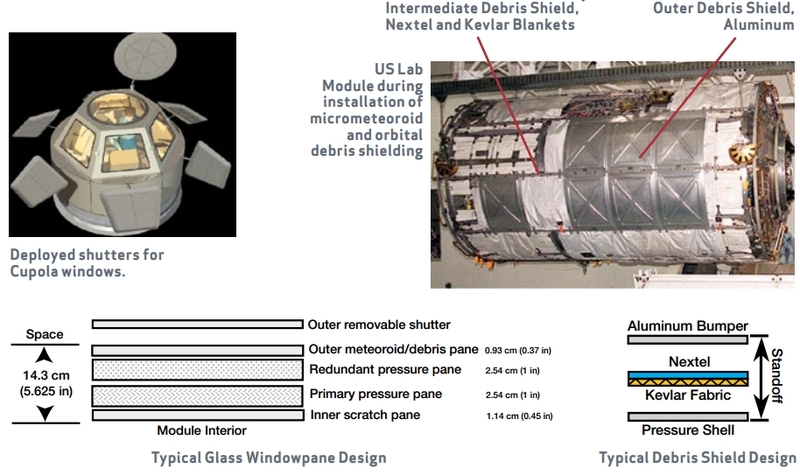 When not shuttered, the Cupola windows present a four layered front to potential impactors: a debris pane, two pressure panes, and an innner scratch pane. The windows are designed to be completely replaceable in the event of severe damage. 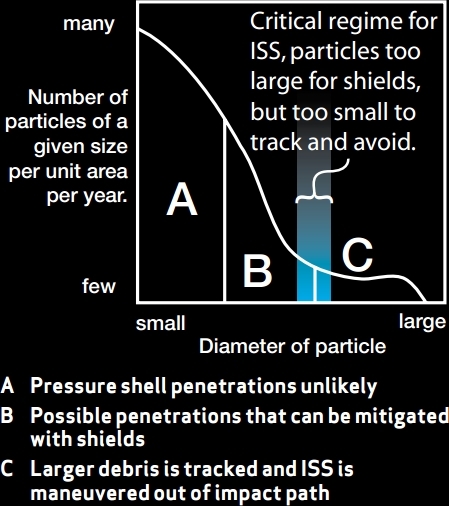 The Cupola’s impactor was likely a class A particle (Credits: ISS Interactive Reference Guide). Even all this shielding is not able to completely prevent ISS from showing signs of wear from its encounters with the flotsam and jetsam of space, hurtling through the barest wisps of atmosphere at thousands of kilometers per second. MMOD impacts occur all the time on ISS and other spacecraft, although most are not easily visible through a window. Returning Space Shuttles have shown pock marks from high velocity MMODs. The Space Shuttle Endeavor actually suffered a similar window impact on STS-126 which produced a hole in its thermal pane. Endeavour was able to reenter without heat damage and with no further propagation of the hole – although analysts initially thought some cracking might occur in the window, which was needed for pilot visibility during landing. Luckily, ISS need not worry about reentry with a broken window. For now, the shutter remains protectively closed over Window 2 while ISS managers evaluate the danger. It is expected that they will soon give the ok to lift the shutter. Micrometeorites may approach ISS from any direction, but are less likely from below where Earth acts as a shield. 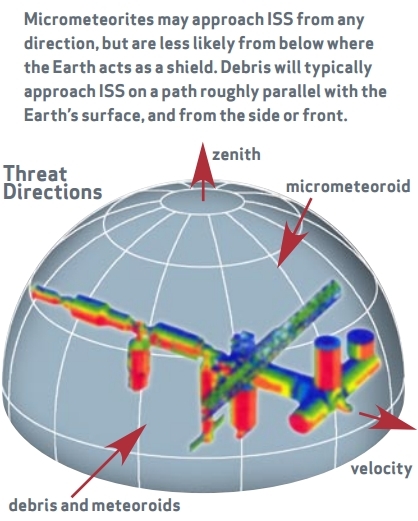 Debris will typically approach ISS on a path roughly parallel with the Earth’s surface, and from the side or front (Credits: ISS Interactive Reference Guide).